A new rug that lights up when you step on it could be the future of floor fashion, not to mention of nocturnal home safety. As if a glowing runway, the electroluminescent flooring could keep you from stubbing your toe during a groggy trek to the bathroom, guide you to the bedroom after a late-night out and even replace a child's conventional nightlight. "The glow that the rug emits is very soft," said co-inventor Leona Dean, of London South Bank University, who also noted the innovation's party applications, "It can provide ambient mood lighting or flash in time to music as a talking point at a party." 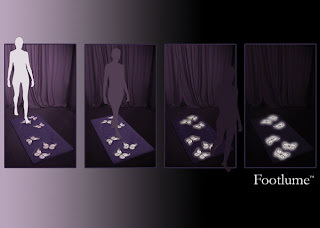 Dean and another LSBU engineering student Zoe Robson developed the light-up rug, called Footlume, for a college course, and they will exhibit the innovation at the Daily Mail Ideal Home Show in London this month. The electroluminescent rug uses rechargeable batteries and lights up in response to the weight applied when a person walks across the carpet. Electroluminescence relies on an electric field to generate visible light. Other light producers include photoluminescence, which is used in many glow-in-the-dark toys; and chemoluminescence, which involves light-producing chemical reactions (as in the body of a firefly). So-called responsive surfaces such as Footlume are considered by some experts the next big thing in interiors for fashion-savvy and techie homeowners.